Welcome to Day 12 of the 12 Days of Holiday Inspiration Blog Event brought to you by "The Inspiration Crew". What a ride it's been! I hope you've enjoyed seeing all these Christmas projects! Every year, I make 80 photo cards for a friend. This is the design we settled on for this year. 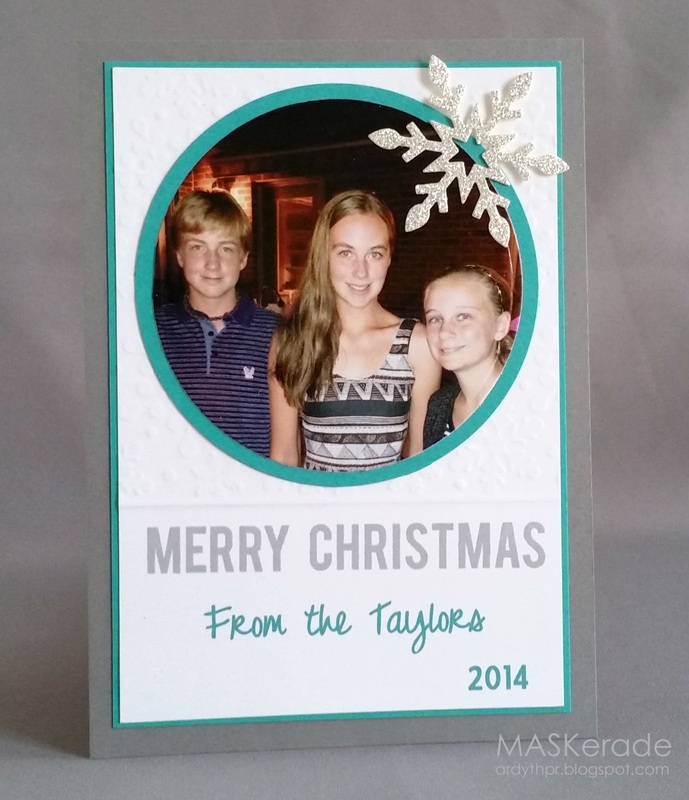 It's a hybrid card - "From the Taylors 2014" is printed using "Just Realize" font, which we love because it looks handwritten and contrasts with the block font of the Merry Christmas from Gina K, stamped in Smoky Slate. The white panel is embossed above the sentiment using a Papertrey Impression Plate. I think it worked really well because the edge gave a nice strong border. The sparkly snowflake is from Clearly Besotted. Here's your last chance to visit all the participants of 12 Days for lots of holiday inspiration! Crisp and clean. Absolutely gorgeous Ardyth. I love the font on the sentiment too! Love the matting around the photo and the snowflake embellishment. All your cards are great. Beautiful way to frame a photo! The Taylors are very smart, and lucky, to have you making 80 fabulous, handmade cards for them, Ardyth... gorgeous! Love the clean, crisp look and the sparkly snowflake. very nice! Thanks for the hop!! nice picture card thanks for the hopping great time! Awesome card, have enjoyed the 12 days, thanks for your inspiration. Beautifully done Ardyth. 80 cards Wow. Awesome photo of the kids - great choice of color for the inner circle frame - works so well with the rusty dark background of the photo. AND, thanks for the info on the font! You would have had an e-mail from me seconds after I spied it, wanting all the deets! It looks like it might be 'thick" enough to cut on the Silhouette. Wow...just beautiful and you really know how to make that gorgeous photo pop! I am sure your friend loves the wonderful cards you created.